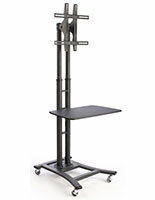 Fits Monitors 32" to 70"
This silver TV stand fits (1) flat-screen monitor between 32” and 70” that weighs less than 110 pounds. 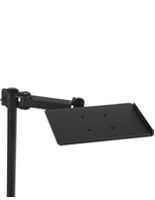 The adjustable mounting bracket even accommodates a screen in either portrait or landscape orientation due to the small size of the mount. 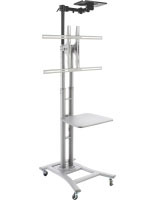 This flat TV stand for floor is equipped with locking casters for easy mobility throughout a room. 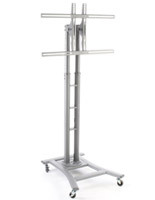 Once a positioned has been reached, simply lock the wheels to prevent movement. 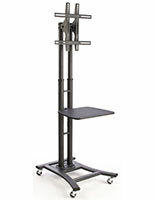 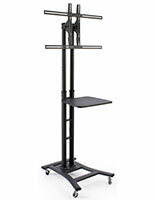 Also included with every unit purchased is a 19-inch display shelf that is height adjustable, with (3) set heights. 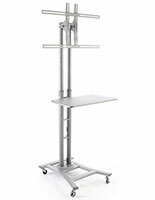 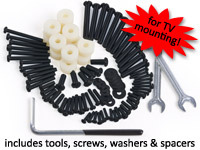 This shelf is ideally meant for holding presentational supplies, including AV equipment and promotional handouts. 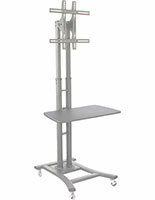 This silver TV stand is also height adjustable and has (8) set heights at which a monitor may be positioned.